We have over 100 free eBooks, templates & checklists to help you gain the advanced skills you need to become an outstanding leader. Follow us or subscribe to stay up to date with the latest professional development resources we add every month. As a busy manager you need to squeeze more out of your working day. Our free productivity skills eBooks can help you to make the most of your time as well as making sure that you get the best out of your team. Successful leadership at work means making a success of the team you have been given. Our free leadership skills eBooks will help you to understand team dynamics, choose the best leadership style and fix team performance problems. Conducting fair and accurate performance evaluations of your team is a key part of your job. These free eBooks provide practical advice on collecting and evaluating performance data, conducting the appraisal meetings, and completing the final appraisal reports. Good communication skills are arguably the most important attribute a manager can possess. Our free communication skills eBooks will help you to plan, structure and deliver your message to get the results you want. From developing the agenda to recording the minutes, our free meeting skills eBooks can help you and your team to maximize your effectiveness in the highly visible forum of a business meeting. Successful project management means delivering your projects on time and within budget. Our free project management eBooks, templates and checklists will help you to know exactly what to do at each stage to make your project a success. The ability to understand finance is crucial to any manger who wants to advance their career. Our free finance skills eBooks will help you to understand financial reports so that you can make informed, intelligent decisions. These free eBooks will give you a good understanding of the appropriate business analysis techniques and terminology to help you to contribute to the strategic decision-making process. These free eBooks will help you to develop your coaching skills by giving you an understanding of the principles of successful coaching as well as the popular models that you can use to help you develop your team. These free eBooks will help you to develop the emotional intelligence skills needed to build the professional relationships that are at the heart of both individual success and team productivity. Our marketing skills eBooks will help you to get the most from every dollar that you spend on promoting your brand, whether you're looking for low-cost PR & advertising or you're developing a customer engagement strategy. Our sales skills eBooks will help you with everything from cold calling to lead acquisition and management including how to choose and use the best software tools to help you get the results you want. Our thinking skills eBooks will help you to become more creative and innovative whether you need to make more time for creative thinking, some general inspiration or specific tips and techniques. These interview skills eBooks will help you to be as successful as possible in your chosen career. Whether you're looking for a new job, facing an interview or trying to get your career back on track, there is something here to help. Browse through our extensive list of free Executive and Management magazines, white papers, downloads and Podcasts to find the titles that best match your skills. When you are working under pressure or doing a task for the first time, it is easy to overlook something or forget to ask a key question. 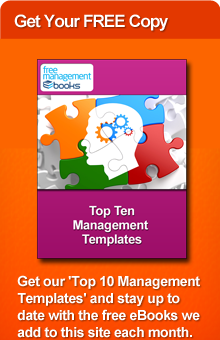 These free management checklists will help you to break down complex management tasks into small controllable steps. Most of the day-to-day management tasks you need to do have already been done by others many times in the past. Our free management templates will save you from wasting your valuable time re-inventing the wheel. More and more companies are using psychometric tests when making recruitment and promotion decisions. Investing time and energy in getting to grips with these tests can supply the extra edge you need to succeed.